This afternoon I got a bad case of leaky eyes. Tears rolling down my face for most of the afternoon. Sometimes they were tears because I was just overwhelmed with the emotion of it all. Sometimes they were tears of heartache because I was overwhelmed with the injustice of it all. 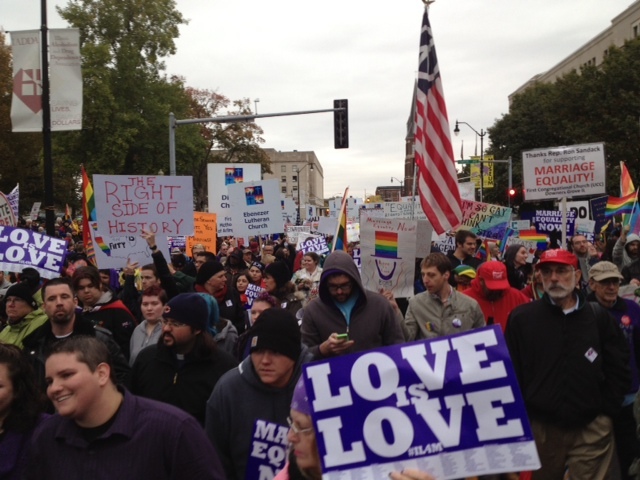 Today, I spent 3 hours just outside the Illinois State Capitol in Springfield with 5000 others braving the cold and rain to rally in support of Marriage Equality in Illinois. For two hours, a steady parade of speakers came to the podium. Some of them were politicians speaking in support of marriage equality. I’m grateful for their courage. Some of them were gay and lesbian people who were angry that this has taken so long. It’s hard to be judgmental about their anger. Some had worked for decades for equality and were deeply touched at sense of growing momentum and this tremendous outpouring of support. I was honored to be part of that support. Their stories often broke my heart and confirmed that it really is high time to get rid of the second class status of same gender couples. A woman and her partner have three children. One of the children became deathly ill. The hospital would not allow both parents into the room because protocol allowed only one “mother” id band. So, they had to take turns going in and out of the room, both of them horrified that one of them might not be there when their son died. A man stood at the podium with his partner of 50 years. Yes, 50 years. His partner is an American combat veteran and wants to be buried at a military cemetery, a right which he as earned with the risk of his very life. If they were married, they could be buried together. As it stands, that’s not possible. The entire crowd could hear the anguish in his voice. A couple in their 70s who have been committed to one another for 50 years cannot be buried in a military cemetery of the United States of America. “We hold these truths to be self-evident, that all men are created equal.” For these two men, the issue takes on a particular urgency. Here’s a confession: I came to this party late. Well into the early years of my pastoral ministry, I was still viewing homosexuality as an an aberration. Gradually, as I have come both to theological maturity and a more informed understanding of human sexuality, I have come not just to acceptance, but to the belief that to deny same gender couples the same benefits and protections of the law is a gross injustice. Let me tell you about a turning point for me. Several years ago, a clergy friend invited me to his union ceremony which was to take place right here in my home town. I had known Phil in the early years of my ministry; he was a pastor in a neighboring congregation. Phil moved away and I lost track of him. When we reconnected, I discovered that he had left the ministry for a time, primarily because of struggles over his sexual identity. He was in a denomination that did not allow openly gay men to serve as pastors. He reemerged as a pastor in the Evangelical Lutheran Church in America and was serving a congregation in New York City. While there, he fell in love with Brett, who just happened to be from Glen Ellyn, where I live. Their union ceremony was at the UCC church just blocks from my home. Sheryl and I attended. It was my first one. It was beautiful. Family values: love, acceptance, commitment, joy, and a sense of service to the community and the world. Those were the values exuded by Phil and Brett, and by their family and friends gathered that day to celebrate their love. This is what I just don’t understand. Marriage of same gender couples is no threat to the institution of marriage. In fact, the very values of their love and commitment to each other is exactly the values that I’d love to see grow and flourish in our society. After my experience today, I am more convinced than ever that marriage equality is a simple matter of justice. And I am committed to being more vocal and more active in making sure that it happens in the state where I live. Now is the time. This entry was posted in Uncategorized and tagged gay marriage, marriage equality on October 22, 2013 by Jim Honig. It most certainly is the time. I am very glad you were there yesterday. Thank you!! Thanks, Marilyn. ELCA Lutherans were well represented!